The Official 'Dog's Raven Search Team' Web Site http://www.dogsraven.net is supported by the upcoming series: 'Search Dog's Raven' The Real Life Animated Adventures of a Wilderness Search Dog Team. My grandfather named me Dog's Raven because I could help my dog find anyone. Like when a raven helps wolves find prey. I use the name Dog's Raven Search Dog Team to honor my grandfather's memory. Specializing in wilderness searches, the nonprofit Dog's Raven Search Dog Team was established in 2006. Services are free to requesting agencies, with priority given to lost children and seniors. We do not search for criminals, or adult evasives (healthy adults who do not want to be found). As a nonprofit organization Dog's Raven relies on donations to offset search expenses and rescue related costs. Qualifications include EMS training, CPR, SAR backup liaison and crime scene preservation training. With over eight years of experience, Ebbey is a veteran wilderness search dog. She has located dozens of lost people, and been deployed on over 250 searches. Thought to be a Rhodesian Ridgeback cross, Ebbey was found starving in a garbage dump on a local reservation. Even at six months of age, Ebbey had high prey and play drive. She was also getting into lots of trouble. Qualities that would wreak havoc for the average pet owner, but are highly desirable for a potential search dog. The clumsy pup was also downright stubborn when it came to tracking down a scent. 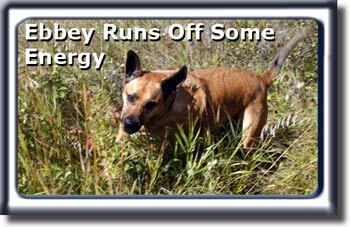 Ebbey isn't just a dog who likes to sniff, but a dog that'll follow a scent until she drops. Ebbey began training as a puppy. With assistance from Mikella's father, and the Mountain Wind Sheriff's Search Dog Unit, Ebbey and Mikella underwent eighteen months of intensive training to become certified as mission ready. Search dog training includes obedience, agility, scent training and exposure to various forms of transportation such as boats, planes, snow vehicles, helicopters, gondolas and ski lifts. The Dog's Raven team also has rappel training. Ebbey gets a treat for every search effort, but gets a new Kong Dog Toy for every successful find. Ebbey's Hobbies: Getting into trouble, though she now chews a squeaky Dr. Noy's pet toy as opposed to Mikella's shoes and clothes. Click on the animated photo for a larger version. Mikella and Ebbey ride a Gondola to their next Search. Mikella is a member of the Mountain Wind Sheriff's Search Dog unit and also gives search dog presentations to schools and other organizations. She works as a freelance artist, illustrating several children's books and animations. Freelancing allows for a flexible schedule, so Mikella can volunteer as a wilderness search dog handler. Mikella: My stepfather was a professional mantracker, tracking criminals for law enforcement agencies in the north western states. As children, both my brother Albert and I learned tracking and survival skills at an early age. Albert even followed in my father's footsteps for a few years. Better suited for search and rescue (SAR), I joined a volunteer search dog unit operated by the Mountain Wind Sheriff's Department. Often searching remote areas, Mikella assists Fish and Wildlife with various wildlife research. She reports wildlife observed on searches and assists with remote tag monitoring studies. In her spare time, Mikella participates in the spring and fall eagle migration count for golden and bald eagles. The migration corridor extends through Alberta and Montana, with volunteers spotting up to 2000 eagles per season. DogRaven.com is supported and paid for by the upcoming animated series..Search Dog's Raven: The Real Life Adventures of a Wilderness Search Dog Team. Dog's Raven TV Show: The Real Life Animated Adventures of a Wilderness Search Dog Team.